A seminal day on Friday for the euro vs dollar which finally broke out of its sideways trading range moving sharply lower and ending as a relatively wide spread down candle finally taking out the 40 day moving average. Following 6 days of flirtation with this key indicator, Friday’s firm move lower has clearly signalled further bearish intent for the euro vs dollar and coupled with the 9 day moving average which has now crossed below the 40 day moving average this has given us an additional bear cross signal as a result. 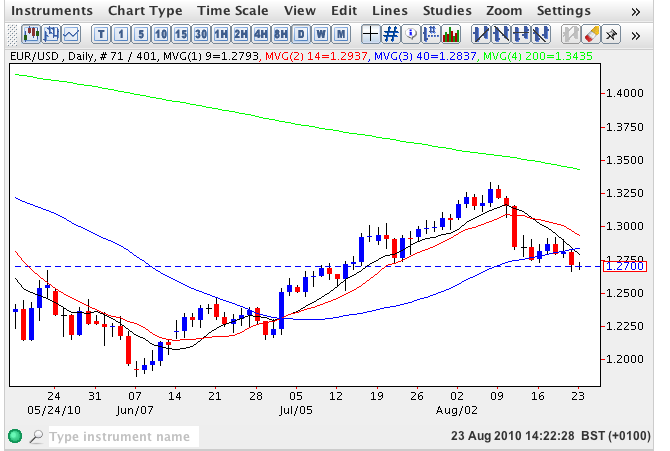 With the recent price congestion now above and acting as resistance to any attempt to rally, the short term trend is now developing into one with a heavily negative tone and should this continue to extend, as expected then we should see a re-test of the USD1.2151 region in due course with a longer term deeper move to re-test support at USD1.1876 in the medium to longer term.